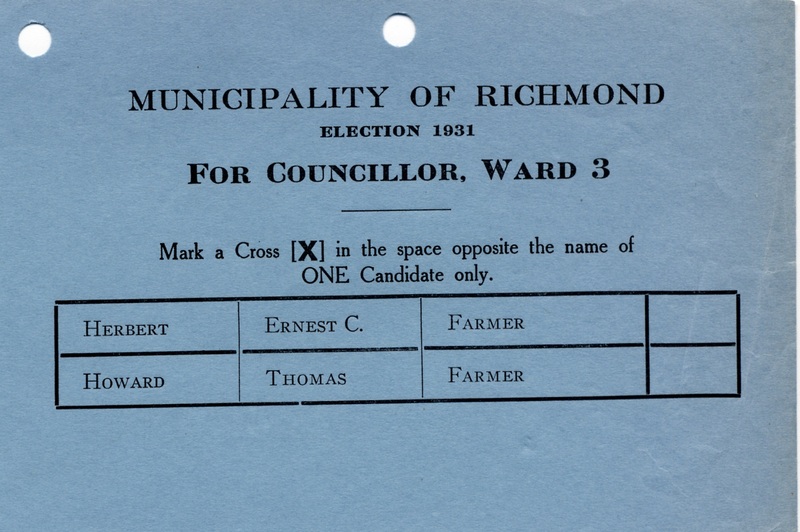 With municipal election day nearing (Saturday, November 15, 2014), we thought it timely to provide an overview of the records in the holdings of the City of Richmond Archives relating to past elections. These records not only provide evidence of election procedures, nominations and final results, but also document the evolution of voting rights and voting systems in the municipality. Official election results, dating back to the first municipal election in 1880, can be found in the reports of the Returning Officer/Chief Election Officer. These reports form part of the minutes of Council, and are accessible to researchers at the Archives on microfilm. The original minutes are housed in the Archives’ vault. The reports document the precise vote count for all candidates and for all referenda or plebiscites put to the electorate. It is interesting to note that although the first election for Council was carried out in January, 1880, the first actual balloting occurred with the election for Council of 1889. Prior to this date, all candidates had been elected by acclamation. Council minutes, and various bylaws, also document the establishment of a ward system for Council representation. Initially, the municipality was divided into three wards but for the municipal election of 1891, five wards were established. All voters in the municipality could vote for Reeve (the term used before the adoption of the title “Mayor”) but those registered on the voters’ list for a specific ward or district could only vote for a councillor nominated to represent that ward. Ward 1 constituted Sea Island, Ward 2 the northwest part of Lulu Island, Ward 3 Steveston and area, Ward 4 most of the South Arm and parts of eastern Richmond, and Ward 5 eastern Richmond. The ward system was discontinued after the municipal election of 1946, when an “at-large” system was adopted for the election of councillors. Another important group of election records at the Archives are the official voters’ lists. They provide not only detailed listings of property owners and residents in Richmond but also illustrate the evolution of the voting system and the municipal franchise. The first complete voters list at the Archives dates to 1915. It is assumed that earlier lists were lost in the fire of 1913 which destroyed the original Town Hall. Front page of voter’s list, 1915. City of Richmond Archives, MR35, File VL-1915. 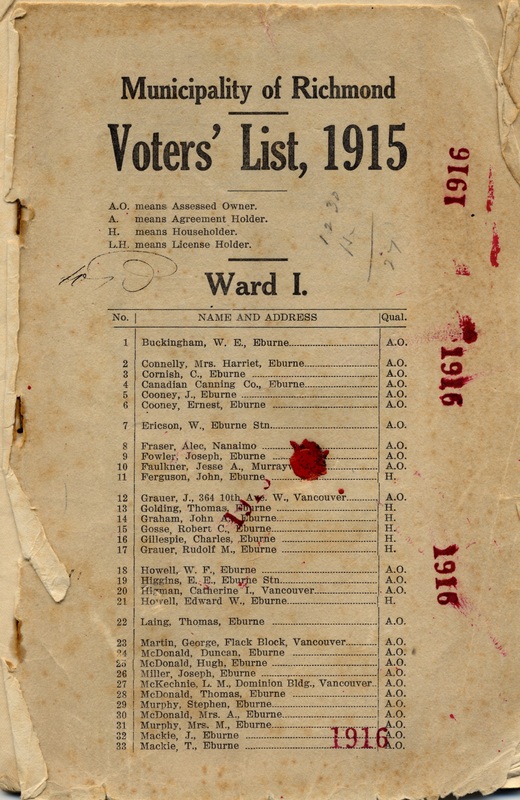 The 1915 list shows voters registered by ward and also contains the names of women who owned property in the municipality, demonstrating how women were given the right to vote in municipal elections prior to being granted the right to vote in federal and provincial elections. Election Ballot for Reeve, 1931. City of Richmond Archives, MR35, File 4501 – Election Procedure. Election Ballot for Councillor, Ward 3, 1931. 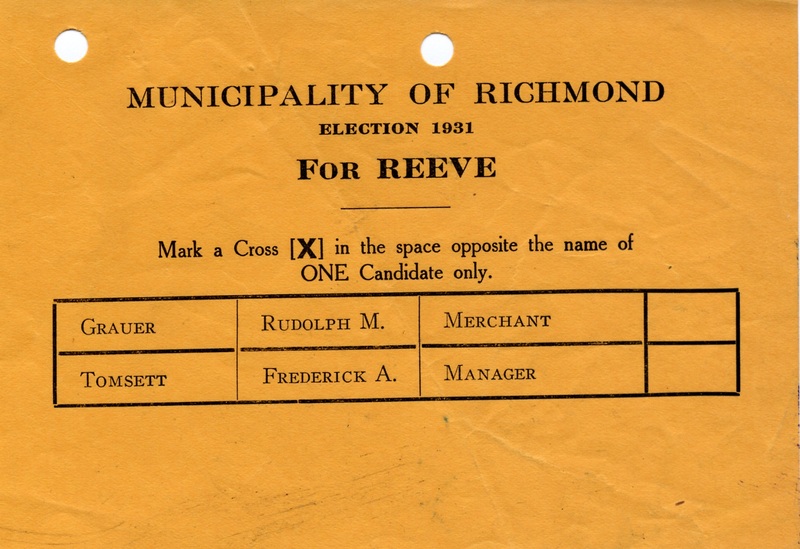 City of Richmond Archives, MR35, File 4501 – Election Procedure. The voters’ lists also show how provincial legislation discriminated against the rights of First Nations people and people of South Asian, Japanese and Chinese ethnicity. The names of property owners of South Asian descent first appear on the voters list of 1948, following changes to provincial statute in 1947 giving them the right to vote in municipal elections. The names of First Nations, Japanese-Canadian, and Chinese-Canadian property owners do not appear on the voters list until 1949, again following changes in provincial legislation in 1948 granting them the municipal franchise. Voters’ lists for municipal elections of 1915 through 1985 are available to researchers at the Archives. Other election records available include extensive election files, including the records of the Court of Revision, all of which document the procedures carried out by municipal officers to ensure the validity of the election process. 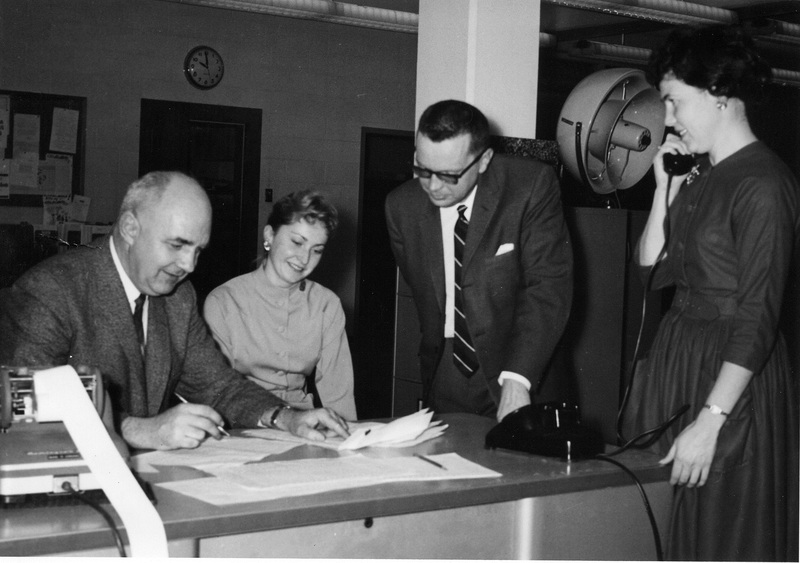 Municipal Clerk Ted Youngberg with election staff, Elaine Smith, Bill Lane and Bev Harper, 1965. City of Richmond Archives Photograph 1986 16 4. 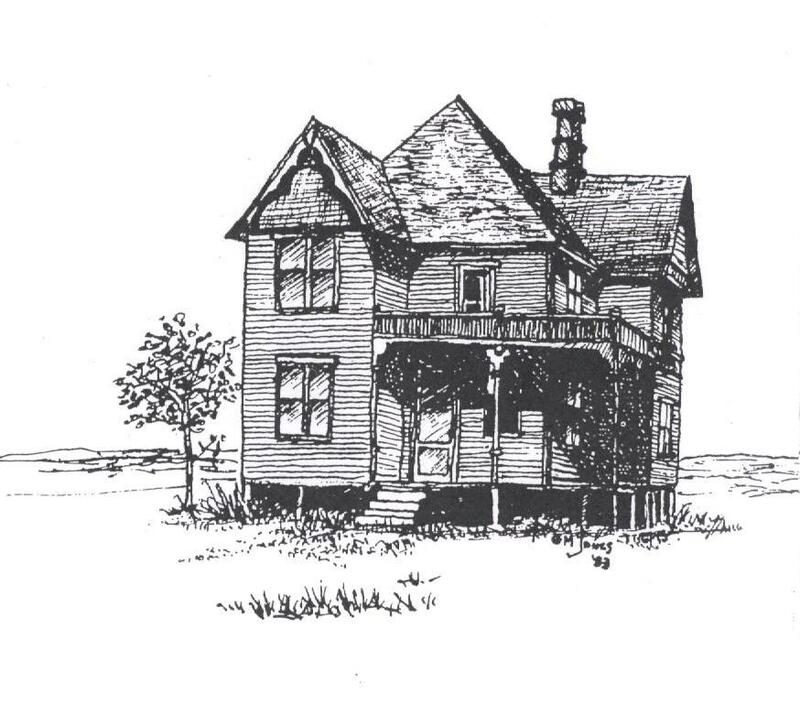 House drawing by Greg Jones, City of Richmond Archives accession 1987 107. 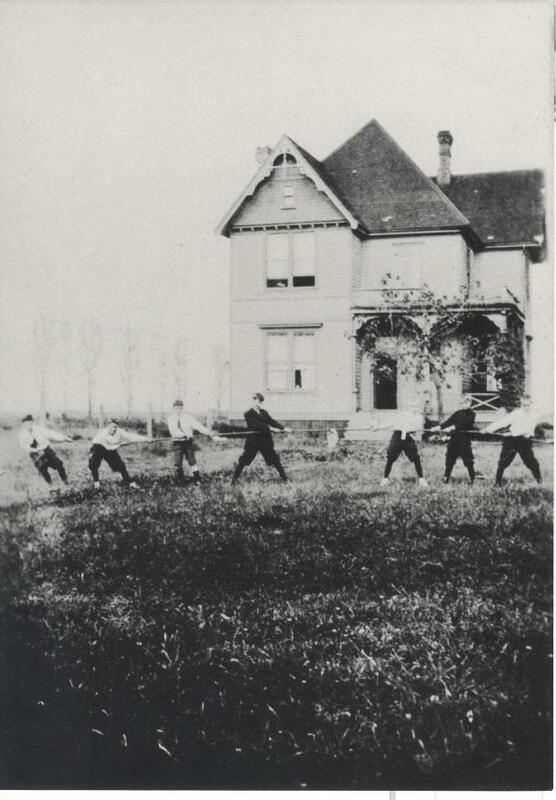 On Halloween,as our thoughts stray to witches and ghosts and things that go bump in the night, would you believe that in today’s bustling city centre on the property now bounded by Westminster Hwy, No 3.and Saba Roads and Buswell Street, stood one of Richmond’s oldest and most haunted houses? The house was built in the 1870s as a hunting lodge by wealthy Englishman Sir Edward Walter (1823-1904), founder and first commandant of the Corps of Commissionaires and whose family founded the Times of London. Sir Edward Walter, 1823 – 1904. Photo from the website http://corpsthinking.com/2014/03/24/same-as-it-ever-was/. Walter was fond of duck hunting and spared no expense in building his retreat. Bevelled mirrors, stained glass, marble and cast iron fireplaces, carved woodwork,elaborate hardware and even a grand piano were imported and apparently floated to the property, probably along the Pearson Slough which penetrated into the area from the middle arm. Why he chose to build his house in the middle of a sodden mudflat quite a distance from boat access to the river is unknown. 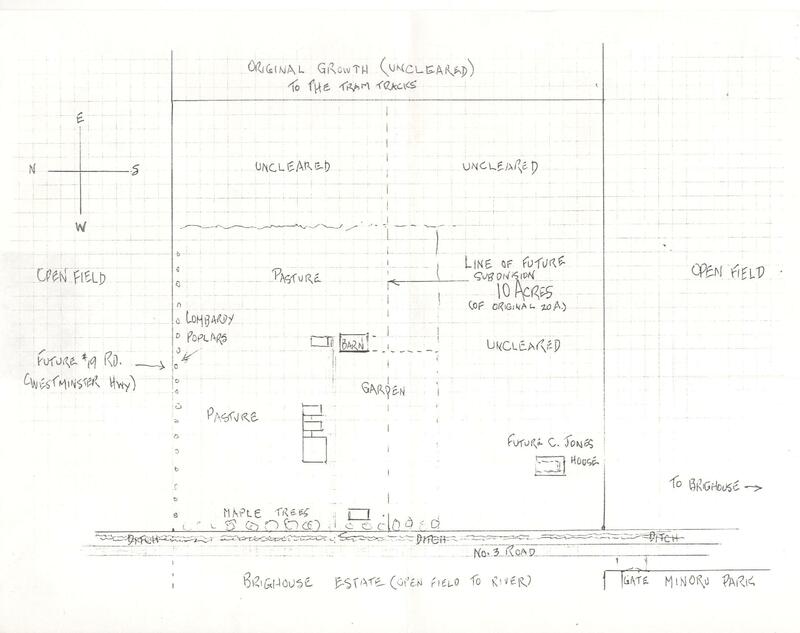 Lot plan drawn by Arnold Jones, City of Richmond Archives accession 1987 107. The lodge was patterned after the connected farm, a design common in New England, England and Wales. In this design the main house, dairy, kitchen (with servant’s quarters upstairs), toilet and carriage houses are connected along a long north facing wall, allowing access to all areas without the need to be exposed to the weather. Apparently Mrs. Walter did not enjoy life on Lulu Island very much and went back to England after about three months, never to return. Sir Edward stayed on for a while, but eventually returned to civilization himself, abandoning the house. 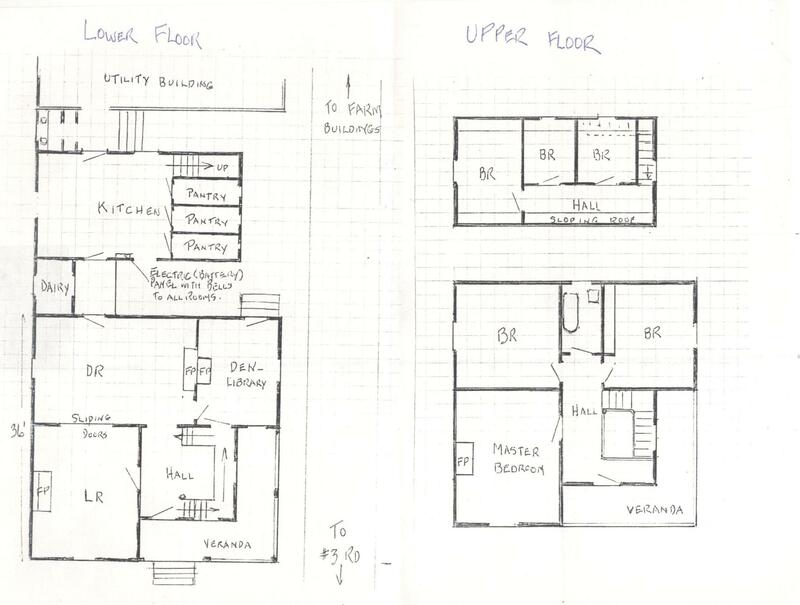 House plan showing “connected farm” style of construction, drawn by Arnold Jones, City of Richmond Archives accession 1987 107. 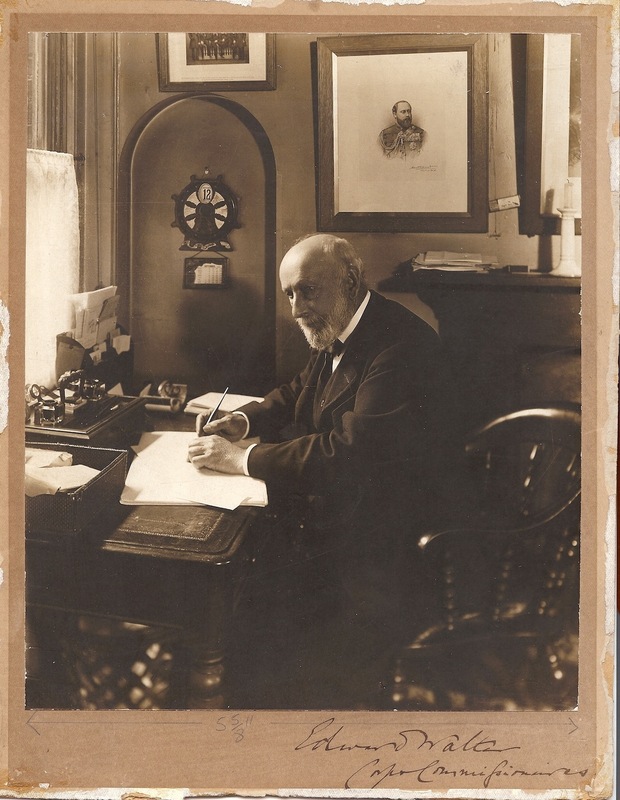 In 1916 Mr. Charles Jones, Waterworks Manager for the Township of Richmond, managed to track down the executors of Walter’s estate and purchased the property. Mr. Jones’ son Arnold described the feelings of unease and apprehension that he and others in his family felt while living in the house, and later in the kitchen/servant’s quarters which his father moved to a different part of the property and enlarged for use as the family home. Footsteps on the stairs and landings when no-one was there were so common that they were generally ignored. Visitations by a man wearing a formal jacket, bowler hat and carrying a cane occured every spring in the house. A woman was occasionally seen peering out the window. These sightings always seemed to occur as the person was waking up and the apparitions would fade away as full wakefulness came. On one occasion, when Mr. Jones was away there was so much banging and clashing in the walls that no one slept for two days. 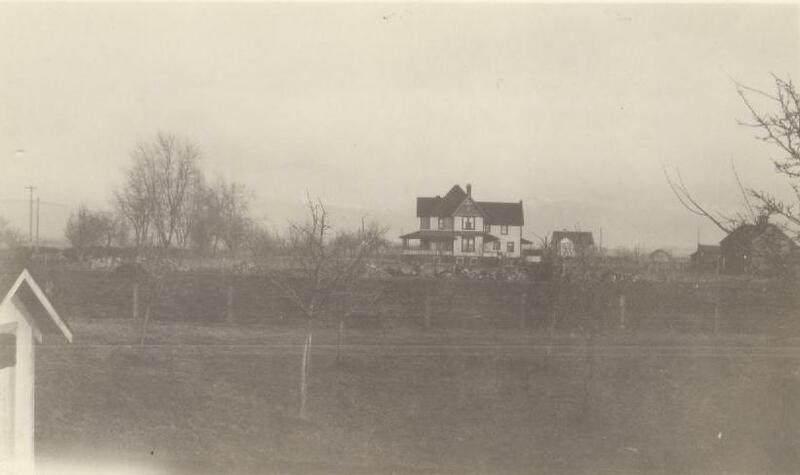 Mr. Jones sold the house to the Berry family in 1921. The Berrys put a large addition on the back of the building. When questioned by Arnold Jones about any strange things they noticed in the house, members of that family described strange noises and seeing a man in a bowler hat while living there. 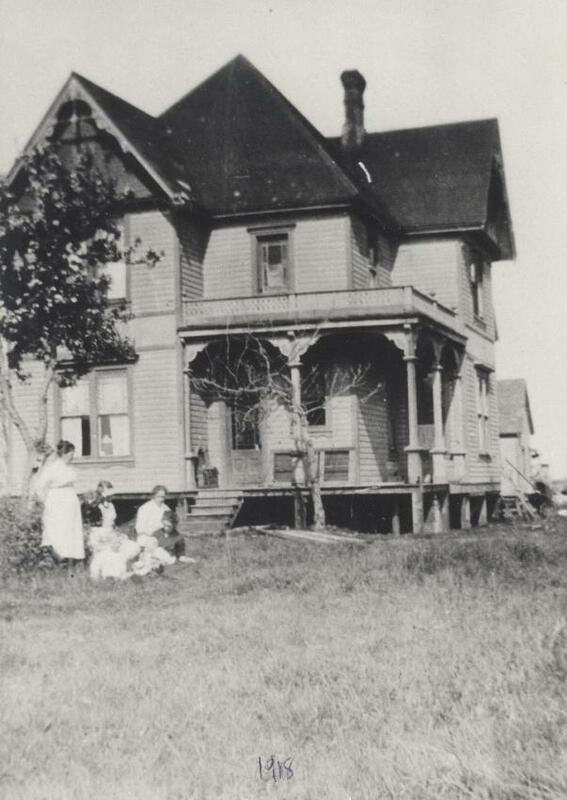 The Berrys sold the house to Mr. Mudry who in turn sold to Mr Thompson and Mr Silverton of Vancouver who renovated the building into suites and opened it as the Lulu Island Tourist Hotel. Gradually buildings appeared around the house as Richmond grew. 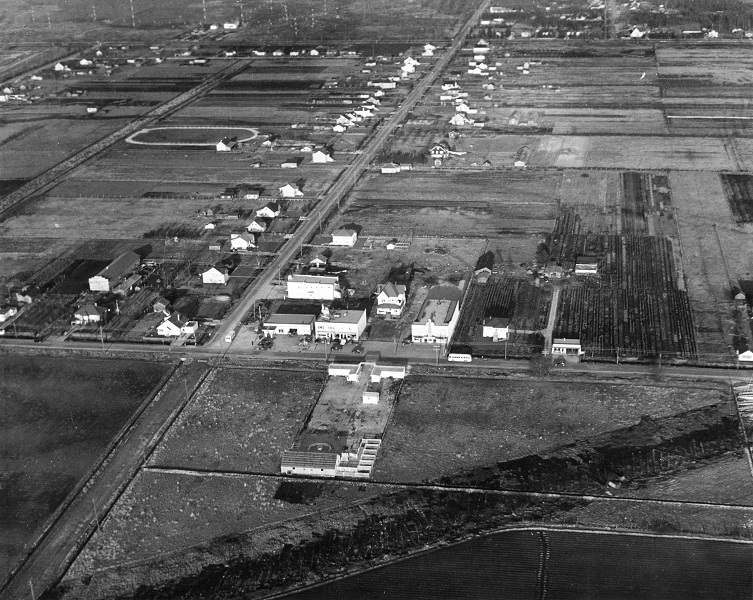 In this image from 1948, commercial development is in the early stages at the intersection of No.3 Road and Westminster Highway. To the left of Sir Edward Walter’s house is the Rooster Cafe. To the right are the Lulu Theatre and Lang’s Nursery. The building was demolished in the late 1950s. Today, everything has changed. I wonder if any of the people living in these modern highrises know this area’s haunted past or have woken to the fading image of a formally dressed man wearing a bowler hat? 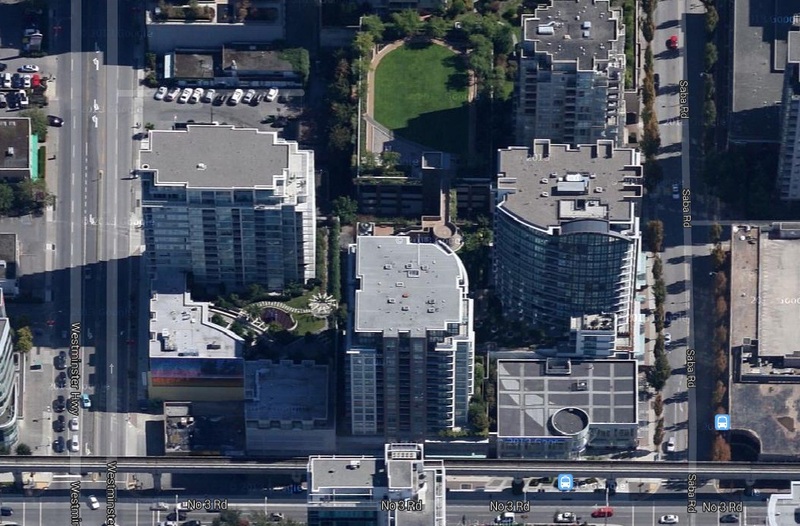 Google satellite view showing the intersection of No.3 Road and Westminster Highway.